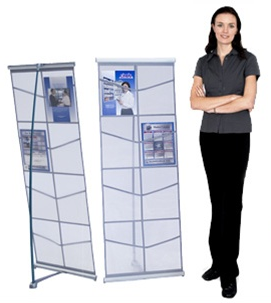 Brochure stands offer a professional method for displaying and distributing your company's marketing materials. Perfect for permanent display in your office, or at a trade show, our brochure stands are available with a number of options, including all-metal carrying cases. Our counters offer a portable method for adding a secure counter to your trade show booth. These compact units offer a balance of quality, stability and portability. Add a full color graphic and personalize your counter to reinforce your brand.